The reflation trade is strong today. I am not sure what the logic is re: buy commodities because banks are getting bailed out but it is what it is. Logic has no place when emotion is rampant. I am changing the stop loss on my Jacobs Engineering JEC short that I put on this morning (and thus far has landed like an egg on my face) since $44 is not resistance when I look at a different chart software - it is closer to $45. So I'll wait out $1 more as we're already near $44. So a close above $45 I'll be a buyer. 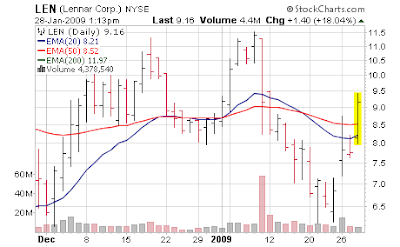 The intraday chart is a 45 degree angle up... ouch. 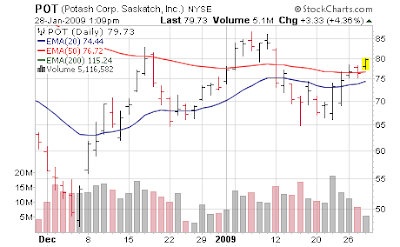 To offset that I am going to add back the Potash (POT) I took profits on earlier and get back the position... I was hoping it would fall back to $66 but it's been strong like an ox. I'm taking this up to a 1.6% position (still not much), replacing shares sold out around $73-74. Based on what I have done yesterday I am probably net short, so I want to get closer to neutral. The market is moving too fast to really move the ship. A lot of people came into the day not exposed (like me) so based on the "action" after 2:15 PM - you'll see a tsunami of buy or sell orders. If we gain S&P 875 and close above 880, you'll see HAL9000 throw in an avalanche of buy orders since the charts will "be good" again. So I'll have to find some things to buy in that case; much of the stuff we hold is not doing much really - its financials, homebuilders & commodities really going. I wrote this weekend that for 1-3 day trade I'd lean to the most beaten down (financials/commodities) - this is day 3, and if I knew the move would be this huge I should of jumped in even if it doesn't fit my time frame. Right in concept but did not partake in the festivities. Feels like staring into a party from outside the window. Lennar LEN is flying high today (homebuilder) - up nearly 18% - but with a whopping 0.2% exposure it doesn't matter. So all in all, I'm chasing my tail today and remembering the words of about a week ago when I said mother market would exact her revenge on me soon. I continue to be surprised by this move simply due to the fact that anyone paying attention knew it was coming. Boggling. p.s. another 10,000 job losses courtesy of Boeing. p.s.s. EBS down 5% today, in a great tape - this is the name we cut back on yesterday. Charts don't lie; people do.